We started hiking from the Allenspark Trailhead (see GPS data below) at 6:57. The sign at the trailhead said it was 6.0 miles to Pear Lake. At Finch Lake, there was an interesting observation. There is a pit toilet just off the trail near Finch Lake. This pit toilet has three walls around it, each about three feet high. The other side of the pit toilet is open. There is a campsite very near to this pit toilet, on the side of the pit toilet that is open. I had to poop real bad. There were people at this campsite munching away at their breakfast. I thought it was just too weird, having these people watch me poop while they ate breakfast so near. We went on, and I stopped in the woods. Makes me wonder why a campsite was put so near to a pit toilet. At Pear Lake, we got a great view of the mountain we were about to climb. We left the trail here, crossing the outlet of Pear Reservoir, and walking along the lake about a quarter of the way. Then we plunged into the forest heading north, to first one small lake, then a second. From this second small lake we continued north, up some very steep and rough, forested country. The forest soon gave way to rock and meadow, then we finally gained the ridge at 10:30 (elev 11309, 40.18514/105.62672). It was a relief to gain the ridge, since the forest was behind us, and we now had a sense that achieving the summit was as simple as traversing the rock and meadow up the ridge. The way up to the summit had no surprises. There were a few rocky patches where we treaded very lightly to avoid rockslides. Otherwise it was just rapid air-sucking heart-pounding uphill ascension. We reached the summit at 11:38, having ascended 1867 feet in 68 minutes (27 vertical ft/minute). On the Copeland Mountain summit the odometer showed 1.62 miles since I turned on the GPS at the last small lake that we had left. The most beatiful view was Cony Lake with Ogalalla Peak towering above it (see picture). Also noteworthy was Isolation Peak, Cony Pass, and Mount Alice. There were two summit registers. 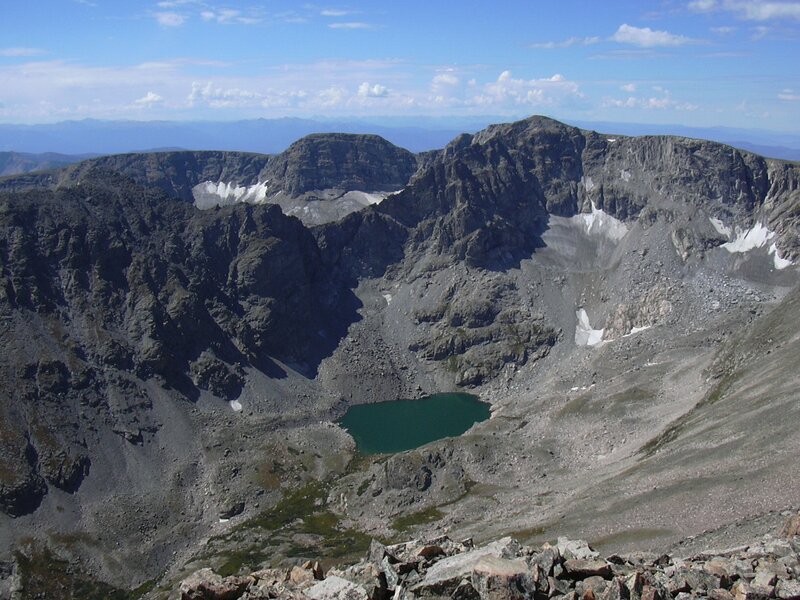 The more substantial one was place there by the Colorado Mountain Club in October of 2005. The last time this register was signed was Aug 14, 2007. Storm clouds were building, so we soon left the summit, returning the way we had come. On the way down, descending along the ridge at one point near 12000 feet, Stefan pointed out a view of the bowl on the southeast side of Copeland. Inside we could see a small glacier. This glacier is not shown on maps, and is not visible from Pear Reservoir, and may not be visible from anywhere on the ridge except where we saw it. Just after we returned to Pear Lake, it started raining. Over the next half hour, as we walked back there was heavy rain and lightning. We returned to our parking place at 16:40. This was a substantial hike, with an altitude gain of 4255 feet, and a total time of 9 hours and 43 minutes.